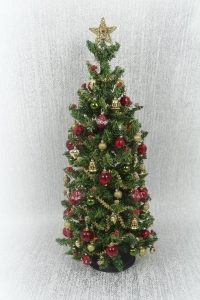 Luxury 12th scale dollshouse Christmas tree decorated in hues of traditional red gold and burgundy. This has been handmade from start to finish by the artisan and decorated with hundreds of handmade and decorated baubles that sway and twinkle upon movement. Approx: 7" high x 3.5" wide.